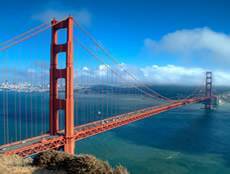 Depart from the UK on your chosen scheduled flight to San Francisco. Upon arrival, transfer independently to your hotel. San Francisco is perhaps one of the most enchanting cities in the United States and has so much to offer. Browse the shops at Union Square, take a trolley car down to Fisherman’s Wharf and experience Pier 39, or take the ferry across to Alcatraz. A trip to the crookedest street in the world; Lombard Street is a must see not forgetting the infamous Golden Gate Bridge; the city has something to suit everyone. Spend this morning at leisure enjoying the sights of San Francisco before collecting your rental car in downtown San Francisco and driving East to Yosemite National Park. Yosemite is best known for its cascading waterfalls & lakes, but within its nearly 1,200 square miles, you can find deep valleys, grand meadows, ancient giant sequoias, fragrant pine trees, a vast wilderness area and a beauty that will take your breath away. 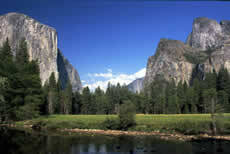 We’ve allowed a day and a ½ for you to experience Yosemite National Park. Returning towards the coast today marks the start of your journey along California’s famous Pacific Coast Highway 1. 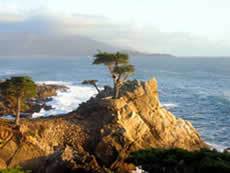 Monterey highlights everything that's best about California from Monterey's seaside restaurants to the Salinas Valley's hillside vineyards and Red Woods of Big Sur. Wander along Cannery Row and browse Fisherman’s Wharf or even take a trip to the Monterey Aquarium, whatever you decide will be a memorable experience. The Pacific Coast Highway is one of the most spectacularly scenic drives in America and a journey that is guaranteed to create a lasting memory for you. 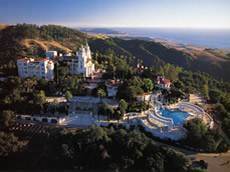 As you follow this dramatic winding coastal road, call in at Carmel, a quaint seaside town with boutique shops and fine seafood restaurants or visit Hearst Castle at San Simeon, the grandiose estate of publisher William Randolph Hearst, overnight in the pretty seaside town of Pismo Beach. After a leisurely morning, continue south along Highway 1, through Pismo Beach and onwards to Santa Barbara After a brief stop at the quaint town of Morro Bay, follow the road inland to San Luis Obispo. We recommend a stop at the Danish heritage village of Solvang, before arriving at the Mediterranean-style resort of Santa Barbara, silhouetted against the Santa Ynez Mountains. Your three night stay allows plenty of time to relax on the beach or by the pool, explore the shops or just sightsee. En-route to Los Angeles, include a visit to the J Paul Getty Museum, featuring an extensive collection of art and sculpture. Continue following the coast down to Anaheim Orange County the home of Disneyland California. Spend the evening enjoying Disney down town and overnight at The Disneyland hotel before spending the following day in this magical world. After a day with Mickey it’s time to visit the rest of Los Angeles but instead of constantly driving we suggest you relocate to the Hollywood or Beverley Hills district. From your hotel, walk out along Hollywood Boulevard, home to the star studded boardwalk and Mann’s Chinese Theatre, or take a 10 minute drive to the world-famous Rodeo Drive, where the rich and famous do their shopping. You may decide to try the theme parks with Universal Studios being so close by. Driving Distance to the airport: approximately 15 miles and ½ hour drive.